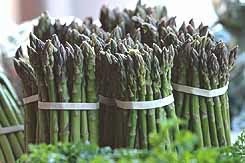 A favourite since the time of the ancient Greeks, asparagus is one of the very first vegetables to be harvested from an early spring garden. This hardy, perennial plant is productive for 15 - 20 years, and grows best where the soil freezes slightly during winter months. It is possible to grow asparagus from seed, but you will be able to harvest your crop much sooner if you begin with one-year-old roots. Select a sunny location free from shade where the soil is rich, deep, and well drained. Remember that asparagus will be growing there for many years to come, so make sure your planting will not interfere with your plans for the rest of the garden. As soon as the ground can be worked in the spring, dig a trench about 12 inches (30cm) deep and 10 inches (25cm) wide. In the bottom of this trench, place a 3" layer of mature compost. If well-rotted manure is available, it may be added as well. Carefully work this layer into the bottom of the trench. If you require a second row, place it no closer than 4 feet from the first. Set the young plants, or crowns, into the bottom of the trench, spacing them 18 - 30 inches apart and making sure they are resting approximately 10 inches below the level of the garden. Spread out the roots, cover the crown to a depth of 3" with sifted compost, and water well. Gradually add fine topsoil and compost to the trench as the plants grow, but be careful not to fill the trench too rapidly, or you might stifle the growth of the young plants. If a good growth has occurred during the first year, it is possible to cut the shoots lightly the following spring. It would be best, however, if the plants are not cut for two years. This gives them time to build up larges crowns. Spears should be cut when they are 6" high, either at, or slightly below, ground level. My grandfather always preferred to cut below ground level where the asparagus was still tender and white. When cutting, place the knife blade close to the spear, run it down to the desired depth, and then turn it enough to cut cleanly through the spear, taking care not to damage other parts of the plant. Careless cutting can cause very serious injury to a planting of asparagus. As winter approaches, the rows of asparagus should be lightly mulched with straw or other material to prevent frost from penetrating the crowns too severely. The brush (or fern) should not be removed or burned, but should instead remain as part of the mulch. The next spring, remove the mulch, cultivate the ground lightly, work in additional compost, and ridge the rows with a hoe. Ridging in this way serves two purposes - it bleaches the shoots by excluding sunlight, and it works valuable nutrients into the soil. The asparagus beetle is considered a serious menace as it is very difficult to get rid of and does much damage. The most serious damage however, occurs when it is allowed to overwinter in the adult stage by hiding in fallen sticks, trash, and leaves. It then emerges in the early spring to feed upon the young asparagus shoots. Garden cleanliness and fall cultivation will prevent the insects from overwintering. Asparagus rust is a disease in which small, reddish pustules appear first on the main stalks. These pustules, when they burst, release a fine rust-colored cloud of spores. Sometimes an entire planting is rapidly infected and dies. But the degree to which asparagus rust does damage is largely dependent upon local conditions. The spores require dampness for germination, and so locations with heavy dews and damp mists are not suitable. Garnish: Parmigiano-Reggiano curls, shaved from a wedge with a vegetable peeler. Bring cheese, cream, and milk just to a boil in a small heavy saucepan over moderate heat, stirring occasionally. Remove from heat and steep, covered, 30 minutes. Pour steeped cream through a very fine sieve into a bowl, pressing lightly on cheese solids and discarding them. Whisk together whole egg, yolks, salt, and white pepper in another bowl, then add steeped cream in a stream, whisking until smooth. Divide among well-buttered ramekins. Set ramekins in a baking pan and bake in a hot water bath in middle of oven until centers of custards are completely set, 40 to 45 minutes. Transfer ramekins to a rack and cool 5 minutes (do not allow to cool longer, or custards will stick to ramekins). Wash chopped leek in a bowl of cold water, then lift out and drain well. Cook leek, shallot, pepper, and 1/2 teaspoon salt in butter in a 4- to 6-quart heavy pot over moderately low heat, stirring, until leek is softened, about 3 minutes. Add asparagus, broth, and water and simmer, covered, until asparagus is just tender, 10 to 12 minutes. After 2 to 4 minutes, remove 6 asparagus tips, halve lengthwise and reserve for garnish. Purée soup in batches in a blender until smooth (use caution when blending hot liquids). Transfer to a large bowl, then pour through a sieve into cleaned pot. Stir in cream, remaining 1/4 teaspoon salt, and pepper to taste and heat over moderately low heat until hot. Working with 1 custard at a time, run a thin knife around edge of each to loosen it, then invert a soup bowl over ramekin and invert custard into bowl. Repeat with remaining custards. 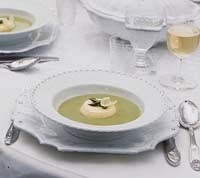 Ladle soup around custards and garnish with reserved asparagus tips and parmesan curls. • Soup can be made 1 day ahead. Cool, uncovered, then chill, covered. Absolutely wonderful! I'm a huge fan of asparagus and now I can even grow it! Can't wait to try the soup recipe too. Thank you! I hope you enjoy the soup, Carley! It's one of my favourites.